Log board cladding (also know as loglap) is very similar to the tongue and groove cladding used on our popular range of Shiplap sheds with the addition of a featured curve shape giving the garden shed the aesthetic appearance of a building made from logs. View our log board sheds below. 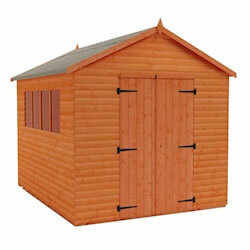 Find out more about our Loglap & Log Board Sheds range. The special log effect cladding is a popular choice as it provides an attractive solution for garden storage making the log board sheds a great product! If you’re seeking a log board shed as additional working space, storage or just somewhere to relax then the Tiger Heavyweight Workshop Shed is the ideal building for you and comes in a range of generous sizes. This superior grade special edition log board cladding looks sensational and picturesque but is also very secure and ridged. Therefore making it the perfect garden building! A few advantages of log board sheds is that it makes them versatile, strong and durable as well as looking superb! We offer free delivery on all of our products across the UK.